A commercial building located in between Fortis Hospital and Apollo Hospital along Bannerghatta road in Bengaluru is being demolished by the BBMP since August 19. The building, ‘Amalodhbhala Tower’, is located in one part of a 2 acre 32 guntas government land which was encroached by the complex’s owner, one Shantharaju. About half the demolition of ‘Amalodhbala Tower’ was complete by August 22. Pic: Navya P K.
This encroachment was mentioned in the report of V Balasubramanian (IAS, Retd. ), Chairman of the Task Force for Recovery and Protection of Public Lands, which was published in June. In addition to Shantharaju, the report accuses the Church of Immaculate Conception, Bengaluru, of encroaching the land. Balasubramanian was formerly Additional Chief Secretary for the Government of Karnataka. The demolition is being done by BBMP on the orders of the Deputy Commissioner (DC), Bangalore Urban district. The DC is the top official of the state government’s revenue department in the district. The initial order for demolition was passed in 2009 by Tahsildar, Bangalore South taluk. Both the church and Shantharaju got stays on demolition many times by filing cases in different courts since then. The Karnataka Appellate Tribunal (KAT) gave the demolition order recently, based on which the DC ordered BBMP to remove the building, as Palike has the machinery for this. On Monday, August 22nd, the fourth day of demolition, Narasimha Babu, BBMP Assistant Executive Engineer at Arekere, says that it would take another 2-3 days to complete the job. The building had more than 20 shops including outlets of Daily Bread, HDFC Bank and Barrista. The other part of the 2 acre 32 gunta land has a small structure, which has not been removed. "That part was also sub-let by Shantharaju to someone. We do not have directions to remove it now," says Babu. The BBMP has placed a board in the area saying that the entire land belongs to it now. However, the land still belongs to the state government, and has been handed over to BBMP for protection. About half of the demolition process is over so far. V Balasubramanian however, says that all is not over yet. He senses that Shantharaju may get another stay now. "Shantharaju has again moved the HC on Friday and may get stay. Hopefully the demolition will be complete by then so the stay would be ineffective. This encroachment has gone on for so long by using loopholes in the legal system," he says. The land was part of the 7 acre 32 gunta government land of survey no. 154/11 of Bilekahalli. Of this, the state government had granted 5 acres for building a cancer hospital (and was later repackaged illegally to Apollo Hospital, see that story here), and the remaining 2 acre 32 gunta was granted to a central government organisation in 1991. The organisation later declined the land, causing the 2 acre 32 g land to remain empty. Dispute on this land began when the Church of Immaculate Conception challenged government grants in High Court in 1991. The land was originally a tank bed and did not belong to the church, writes Balasubramanian in his report. So vexed is Balasubramanian with the case that he calls the church ‘not so immaculate’ in the title of the section on this case. Alongside ongoing demolition work, BBMP has put up a banner in the 2 acre 32 gunta land. Pic: Navya P K.
After hearings, HC dismissed the case in ’93 upholding government’s right to the land. The church filed an appeal against this order, which was again dismissed by HC in ’94. Soon after, the church filed a suit before the City Civil Court. Civil court ruled on this case after 15 years, in 2009. The Task Force report says that the church used this opportunity to sell off 1 acre 30 gunta land (of the 2 ac 32 g) to an individual Shantharaju. The land was sold in September 2008 at the price of Rs 1 crore. Shantharaju used the land to build a commercial complex. According to BBMP, Shantharaju was earning Rs 6 lakh per month as rent from businesses in the complex. When the city civil court finally ruled in 2009, it was in government’s favour. The church again filed an appeal challenging this order in the HC, which is pending. It was at this time that the Tahsildar of Bangalore South taluk issued a notice to Shantharaju for removal of his building. When Shantharaju did not respond, the Tahsildar passed an order for demolition. This action set off a spate of court cases and appeals by both Shantharaju and the church, all the while suppressing information on the earlier court verdicts, notes Balasubramanian in his report. The church filed one case with the KAT (Karnataka Apellate Tribunal), while Shantharaju filed four cases in the HC, asking for interim stays. Though HC ordered officials to take action on hearing Shantharaju’s first petition itself, he filed more cases on the basis of technicalities such as not receiving demolition notice. ApartmentADDA is a hosting a workshop on the various aspects of managing an apartment complex. 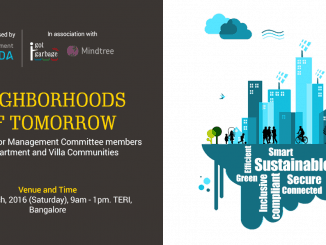 The workshop will be held on Saturday, March 19 at the TERI Complex in Domlur. If there’s one place left in the city where one can survive by speaking Kannada alone, it has to be Basavanagudi, says PR Vishwanath. He recalls the golden days he spent as a youth in this area.